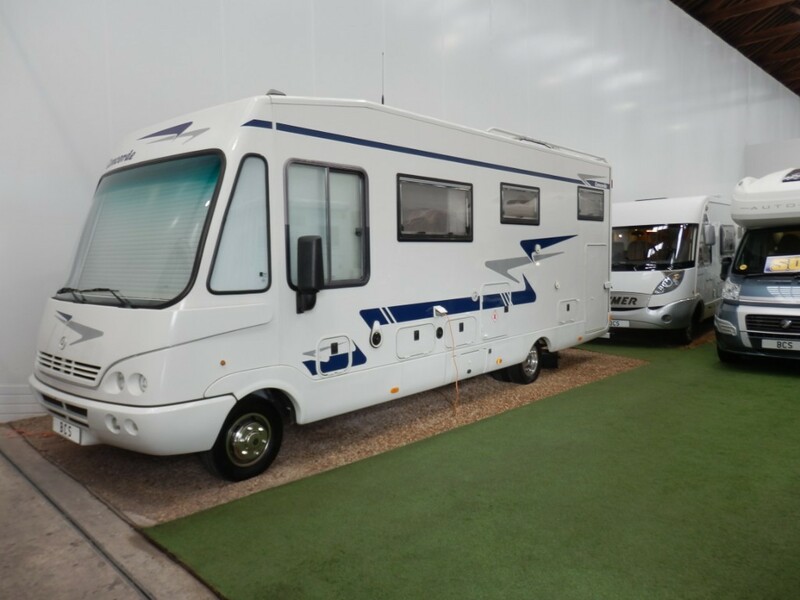 This 2002 Concorde Charisma comes is an automatic, left hand drive motorhome which is fully loaded and comes with 12 months MOT, 3 months personal BCS warranty, and a full major service. It is a winterised vehicle with double floor construction and an ALDE wet central heating system. There is a cat 1 TOAD alarm and immobiliser, lots of external carpet-lined storage, a double door heated garage large enough to accommodate a motorbike, external BBQ and shower points, and an on board generator. To the rear of the motorhome you have a double transverse bed with overhead cupboards. There is a sky light here and for privacy there is a bedroom door. In the centre you have the seating group with an L shaped sofa which has two forward facing, three point seat belts allowing you to carry passengers of all ages. Facing is another sofa with underneath storage space. Over the cab is the second bed, a double drop down, making this a lovely four berth motorhome.